Israel and the city of Jerusalem has been the subject of numerous graphic novels over recent years. The land, and the people who inhabit it, has a history that spans thousands of years. And that history is so rich, it seems that only visuals provided by graphic novels can really do it justice. 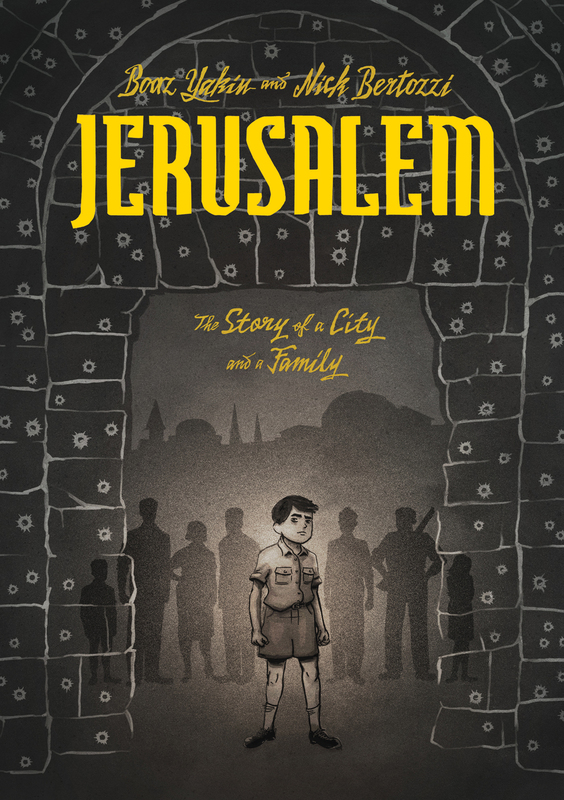 This April sees the latest release to take on the subject, Jerusalem: A Family Portrait is by Boaz Yakin and Nick Bertozzi and published by First Second. The think graphic novel is based on the experiences of Yakin’s own family. It’s a sweeping look at the founding of Israel through the eyes of one family. This graphic novel tells the story of three generations and fifteen very different people as they are swept up in chaos, war, and nation-making from 1940 to 1948. Faith, family, and politics are all put to the test during this challenging time when nothing is clear and no parth was smooth. Yakin’s family lived in what was at the time Palestine during this period and were caught up in the turmoil of war and the founding of a nation, just as his characters are. The comic feels like an epic miniseries you’d find on PBS. At times it’s dry and slow, but this is a slow story about family and the growth of one thrust upon the backdrop of the founding of Israel. The graphic novel is think spanning years and so many characters to keep track of it’s easy to get lost. But, the overall package is worth it. It’s from the point of view of people that were there, but at the same time, this isn’t a propaganda piece defiantly taking on one side. There’s lots of nuance here as to who is right and who is wrong, that’s between those battling as well as within the family. This is a work of art mixed with historical fiction. There’s a lot here, and a lot of small details and experiences that aren’t part of the history we’re presented with regularly. For that, it’s a great way to dive in and get a different perspective of those events 70 years ago. This is a prime example that shows comics aren’t just super heroes and tights. They’ve grown up, much like the nation this one tells about. This is a piece of history presented in an easy to digest form. Definitely should be on everyone’s “to read” list and I imagine will be on many “best of” lists when the year ends.